Insurgent and Allegiant by Veronica Roth. Harper Collins, 2012 and 2013, respectively. Currently Available. Face Value: Consistent and respectable. When I reviewed Divergent a couple of years ago, I noted my appreciation for the covers and I continue to like them. The former Chicagoan in me appreciates the recognizable features of the skyline and the airport. The distortion of the faction symbols over the course of the trilogy reflects the book and the branding while still looking different and interesting. While this isn’t necessarily a piece of art I’d want to hang on a wall, I have no qualms about reading it in public. Does it Break the Slate? YES. Said it about the first book and if anything, Tris becomes even more of a Slatebreaker over the course of the trilogy. She’s very much an action hero, but she’s also thoughtful, loyal, determined and smart. We also see her make terrible, incredibly stupid mistakes – because her good qualities are also paired with actual human flaws. And once again, Tris is not the only tough girl in a sea of boys – in the world of Divergent and its sequels, women hold high ranking power positions, they are good and evil, they are insurgents and politicians and rebels and scientists. Gender is relevant in this world, but it is not the only signifier of any one quality. And the real and true friendship that develops between Tris and Christina might be my favorite in the whole series. Including romance. But if we are talking romance, despite their fights and occasional total wrong choices when it comes to protection, etc. I found that Tris and Tobias have a relationship built on mutual respect and love. I like the way it changes over the course of the books, and the ways in which they are both there for each other and sometimes let each other down. Who would we give it to? Judging by the wait time at my local library for the hold to come in, I don’t think I have to work too hard to sell this book to readers. I am actively trying to convince my coworkers to read it before the movie comes out though. 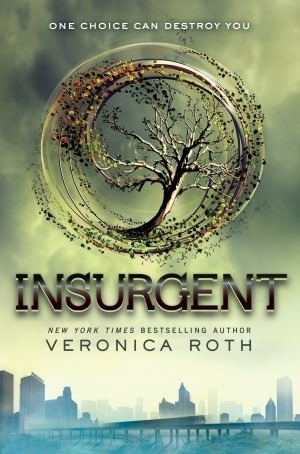 Review: I read Divergent soon after it was published and I really loved it. But by the time Insurgent came out, I was feeling some pretty strong dystopia fatigue, and somehow never got around to reading it. I checked it out of the library twice, even, but then got distracted by contemporary realism or adult fiction or something and had to return it before reading. But with the excitement surrounding the release of Allegiant and my genuine excitement when I saw the movie trailer re-inspired me, and I finally read the sequel. I am so glad I did! 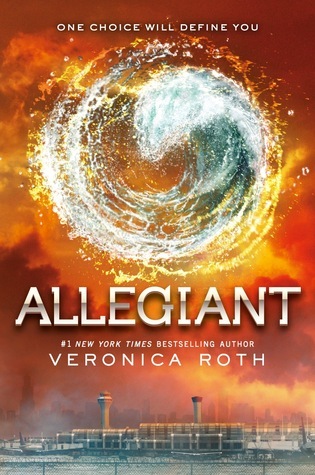 Because after reading Insurgent, I dove immediately into Allegiant and I have to say – I really, really love this series. It is a great piece of dystopian fiction, one that draws on real contemporary fears and creates a compelling, convincing alternate future reality. The Chicago setting added a lot for me, and there were tons of moments where I felt that thrill of excitement that comes from recognizing a familiar landmark. The characters grow and develop in meaningful ways and Veronica Roth makes bold choices in her storytelling that pay off in a big way. At one point, Brianna and I discussed reviewing sequels, and we decided that we only would if we felt that we had something different to say about the series after reading a follow up than we did in our first review. And after reading both of these books, I definitely felt that I had new things to talk about than I did in that first review. And I knew I wanted to talk about these two books together. But now I find myself in a tricky position of writing a thoughtful, analytic review of these two books I loved, that cover a ton of content, without giving away spoilers. And I don’t want to spoil anything, because, while I believe that the books would still be good even knowing what comes next, the surprises were really rewarding when they happened, both emotionally and in terms of plot development. 1) Young people have a ton of agency. When society as they have always known it starts to fall apart, we find our young protagonists in positions of real power and change. And they are respected for their abilities and intelligence, not just as symbols of a movement. 2) As I mentioned earlier, there are a lot of really different female characters who respond to their circumstances in drastically different, but equally Slatebreaking ways. Tris, Tori, Cara, Christina, Natalie, Joanna, Lynn, Nita – even small characters are given meaningful and fully realized character profiles. 3) Characters don’t get let off the hook for the bad things that they do. Our protagonists do some terrible things. They have good reasons, but still. And the fact that Tris never really gets over what she did to Will, that our characters are plagued by the bigger picture of their rebellion even when it is the right thing to do – it’s meaningful. Plenty of action stories paint a picture of righteous violence, and I really admire the way that violence always has personal consequences, even when it serves a greater purpose. 4) Writer risktaking. It’s hard to write a series that has a devoted fan base. And Veronica Roth takes some big risks that I thought were GREAT for the ultimate storytelling. I know some people disagree with me on this one. But I loved it. 5) No baby-filled epilogue. So many series I love (Harry Potter, Hunger Games, I’m looking at you) will end the series with a terrific final book and powerful ending, only to stick us with a short, reductive epilogue that only serves to tell us that our main characters procreated. I’m all for imagining a future for the characters we loved reading about. I’m all for fans writing about it online actually. But I don’t want it in 20 pages at the end of a series. Leave us with the emotional punch. Veronica Roth totally does this for us. So now that I’m back up to speed on these, who wants to go see the movie with me at midnight when it comes out? Insurgent was reviewed from a library copy. Allegiant was reviewed from a copy purchased at Changing Hands Bookstore in Phoenix. This entry was posted in Reviews, Young Adult and tagged Chicago, Divergent, Dystopia, Sequels, Speculative Fiction, Veronica Roth. Bookmark the permalink.